Prayer Beads, also called "omoinotama" or "nunju" in Japanese, are the small wooden beads strung on a loop used in Buddhist worship. The number of beads is typically 108, corresponding to the 108 earthly desires or sins that the beads have the power to extinguish. 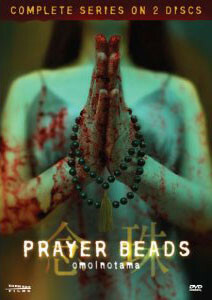 "Prayer Beads" is a series of 9 episodes of 30-minute dramas strung together, with the characters in each episode designing one thread of fate. The short independent episodes are skillfully linked together to become one story. The protagonists' dreams and fears and feelings about this life are all taken up and spun around to reach a dramatic conclusion in the final story. Masahiro Okano, a notable CGI & SFX director who has joined the James Cameron crew on "ABYSS", works as the main director on this series, supervising all the episodes. On "Prayer Beads", Okano collaborates with some of Japan's best talents in cinematography, CGI and special makeup to create incredible imaginary visuals to bring in the horror to the audience's eyes.